One of the best things about travelling around Finnish Lapland in summer was the sheer number of unique experiences that were available. Even though much of the region shares a very similar geography — rolling fells covered in dense birch and pine forest broken up by hundreds of lakes, which in turn are dotted with thousands of islands — there were so many different options for getting out and exploring that nature that I could try something new in every spot. 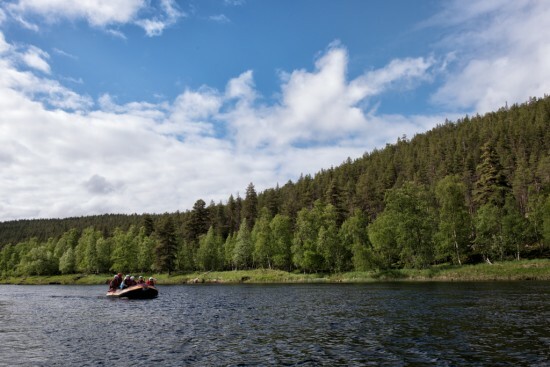 Rafting on the Ivalojoki river — a trip that only happens once a year. In Saariselkä, a ski resort town in the Inari municipality in northeastern Finland, this not only meant that I was trying new things, but that I was also trying things that pushed me well outside my comfort zone. Even something that seemed perfectly straightforward on my itinerary — visiting a husky farm — turned out to be a bit of a challenge, but that just made my stay that much more memorable. So what were those challenging experiences, and would I recommend them to you as a summer visitor to the Saariselkä region? When I did a flying visit to Lapland in 2012, I fell in love with dogsledding. I had the most adorable team of dogs — led by Liza Minnelli, no less — that alternated between giving me bear hugs (when not in the harness) and the unbridled joy of running across the wilderness. On my monthlong trip in 2013, I managed to fit in three dogsledding trips, and those cemented the activity as my favourite thing to do in Lapland. 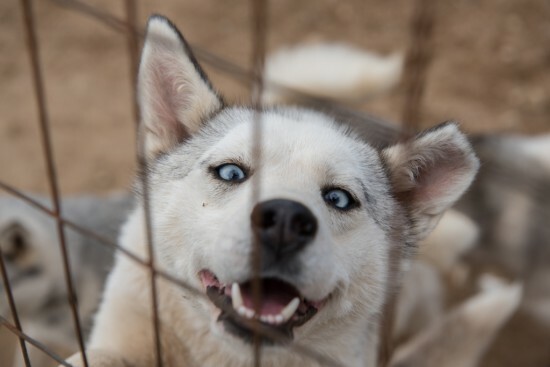 I mean seriously, how could you not love an adorable (and slightly cross-eyed) husky like this one? Obviously, I wasn’t going to be able to go dogsledding in summer; after all, just a little bit of activity in temperatures up to 50º higher than winter leaves huskies panting. That didn’t mean I couldn’t go visit and get a few more bear hugs though! Kamisak Farm lets you do just that in summer. For €15, you can visit the farm for 1.5hrs and learn all about everything that goes into running a husky farm with more than 100 dogs. It was fascinating to hear about the sheer scale of the operation and all the small tasks that has to be done to make sure everything runs smoothly. One of many multiple-times-daily tasks on a husky farm — feeding 6 ravenous puppies at once. It was even more entertaining to get into pens with some of the dogs. Their boundless energy — particularly in the case of the six-month-old puppies — made it almost impossible to take a well-framed photo, so eventually I gave up and just spent my time playing with them instead. As we sat in the mothers pen with the month-old puppies — so small that they looked like they’d barely opened their eyes — thunder began to echo across the fells. My guide, a young French man who was spending the season taking care of the farm, quickly kicked into action; before I knew it, I was on the back of a quad bike riding up to the upper farm. One of the dogs there had a penchant for destroying her doghouses, and as a result, she needed to be taken into the house for the thunderstorm so she didn’t end up cold and miserable. 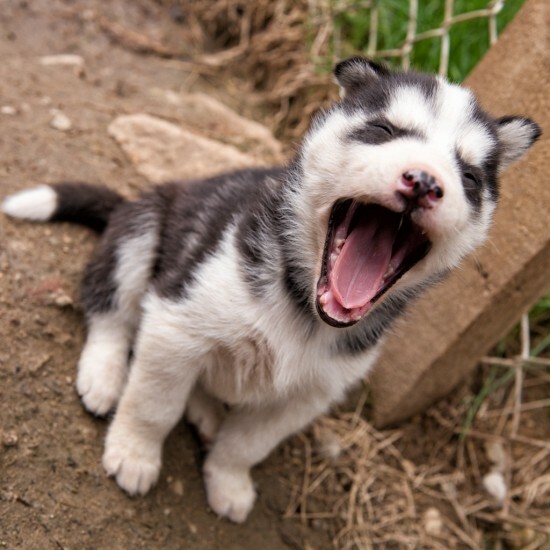 Seriously, it doesn’t get more adorable than this yawming month-old husky. At this point, I transformed from a visitor to a farmhand. It was impossible for my guide to drive the quad bike and hold a squirming husky, so I was given the honour of holding her. Because I needed both arms to keep her from leaping off mid-ride, I had no way of holding on to the ATV on my own; luckily, I managed to use what little balance I have to keep us both from toppling off the side as we went around corners! By the time I sprinted to my car through the beginning of a deluge, I felt like I had a much better understanding of what it’s like to take care of a husky farm than I ever got when I visited in winter. While it would be incredibly rewarding and full of puppy cuddles, it is also exhausting, both physically and mentally. And I was there for less than 2 hours! 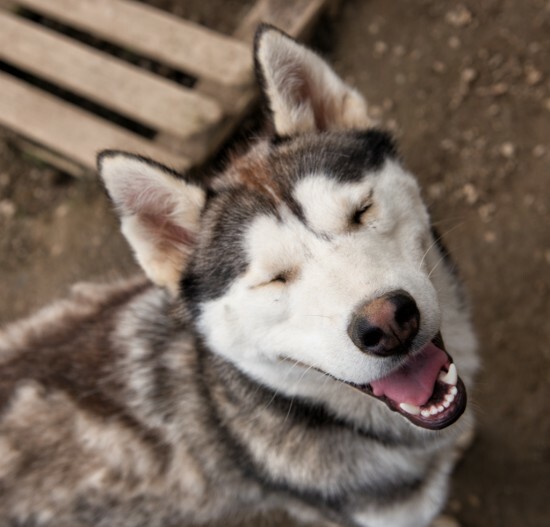 This smiling fully-grown husky is doing pretty well in the adorable stakes too. When I was in Enontekiö at the tail end of my winter Lapland trip, I attempted to go ice swimming — that crazy Finnish activity where they cut a hole in the ice, keep it from freezing by putting a small motor in it to move the water around, and then jump in. After building up my courage in a sauna, I sprinted outside in my swimsuit — in temperatures around -20ºC — and slowly lowered myself into the water. The stream that runs past Fell Centre Kiilopää, just outside Urho Kekkonen National Park near Saariselkä. On the upside, I didn’t give myself a heart attack (which would have been a problem since no one else was around and it probably wasn’t the most intelligent thing to be doing), but on the downside, the water only got up to mid-thigh before I turned tail and ran back to the sauna. My legs were so cold that I didn’t even put my flip flops back on. I just ran. Barefoot. Through the snow. With that experience in mind, I was happy to just sit in the smoke sauna at the Fell Centre Kiilopää and forego the accompanying swimming experience. Sure, it was at least 10º outside and the water in the small stream flowing out of Urho Kekkonen National Park was a balmy 6ºC, but in technical terms, it was still bloody cold. The relatively innocuous-looking swimming area outside the sauna. That was until I struck up a conversation with an American family. The father in the family was Finnish, so the kids had been coming to Finland for family vacations as long as they could remember. As a result, they were well versed in jumping into freezing cold streams, and after a lot of goading, I found myself gingerly stepping in to the water as well. That first step into the water is something I won’t forget anytime soon. It was instant, aching pain, yet I kept going, the cheers of four people pushing me further. 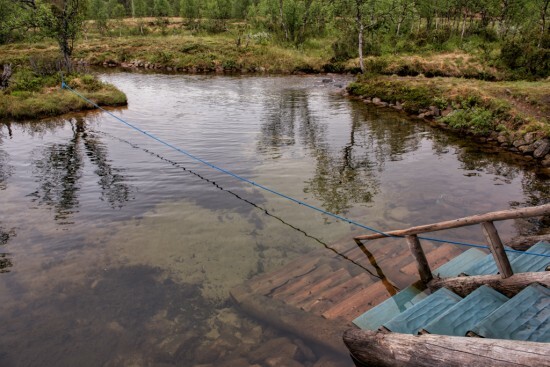 I held on to the rope leading from the wooden staircase across the stream, and when I got deep enough, I quickly dunked myself before sprinting back out again. Then it was back into the sauna for another round, staying until I couldn’t stand the heat before repeating the whole experience once more. The smoke sauna at Fell Centre Kiilopää. I have to admit that it got much easier after the first time and that it was actually quite invigorating, especially once I got back into the sauna. Still, after three times, I waved the white flag and went to my room and to bed. I slept well that night! 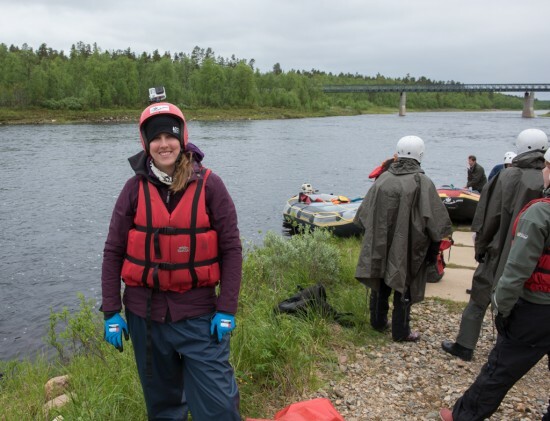 While the rivers of Lapland are no stranger to rafting — as I found out on my trip along the Kitkajoki in Ruka — the trip that Luonto Loma Pro Rafting offers down the Ivalojoki is quite different. 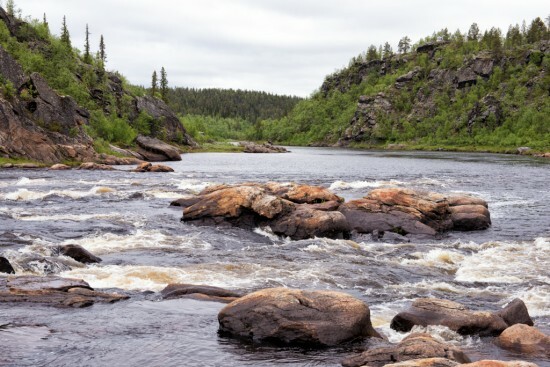 This trip happens but once a year (near the end of June) and covers a stretch of river more than 70km long between the hamlets of Kuttura and Tolonen. The sheer distance covered means that rafters gather in town around 8am and don’t make their way back to Saariselkä for a whopping 13-14 hours. Suited up and ready to raft the Ivalojoki. Yes, I know the GoPro on the helmet is a good look. From the beginning, this was a challenging trip. Finns from all over were in Saariselkä for the weekend so they could participate in this special event, and as a result, I was the only person on the trip that did not speak Finnish…or at least, any more Finnish than kiitos (thank you) and kaikki mela! (all paddle!). Luckily, like most Finns, the other people on the trip were fairly fluent in English, but much of the official commentary and instruction was done in Finnish. Even with a rough translation from the guide behind me, I felt like I missed some of what was going on. The other challenge of the trip was not how we would navigate the white water, but how we would motor through the substantial sections of the trip where the river was hardly flowing at all. The other two rafts were equipped with motors that revved up at every opportunity, but our raft didn’t have one. My initial fear that we would have to paddle the whole way — something I was definitely not fit enough to do — was assuaged when one of the other guides tossed a rope to us and began slowly puttering along with us as his tender. The size of most of the rapids we went down on the Ivalojoki. The white water itself was not challenging — at most, the rapids were a category three. They were big enough to provide periodic excitement while not getting us completely soaked. That was a good thing; while getting drenched is usually most of the fun with rafting, in Lapland, it would have meant being very cold for a very long time. 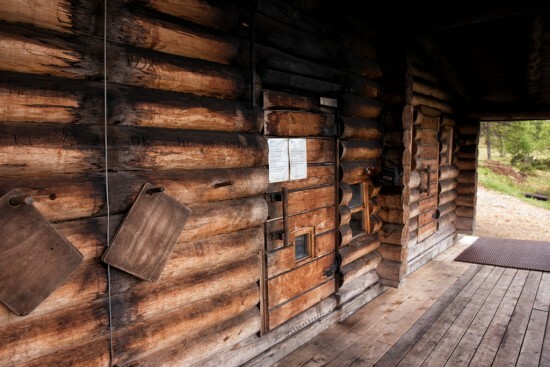 While the trip was very much centred around experiencing the wilderness and a river with virtually no inhabitants living along it, it was also a historical trip. 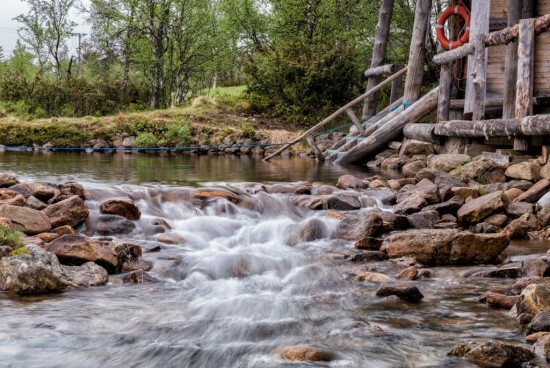 The Ivalojoki is the most famous of the gold rivers in Finland, and while gold is a mere historical tidbit to most, there are still people actively digging for gold there today. While we didn’t see anyone panning for gold — the people we passed in the river were all fishermen — we did see plenty of evidence of days long past. The buildings that were the last remnants of the gold rush at our dinner stop. One of our scheduled stops was near a hut that seemed to be placed solely for its view high above the river, but in fact, it was just beyond a huge rock field that was actually the detritus from the search for gold. Another stop was at the Kultala Gold Mining Village, which was built alongside the river in 1870 and is still in pretty good nick today. 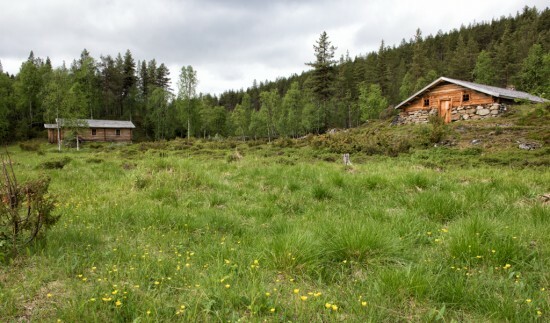 One of the old wooden buildings was open for us to stroll through, but the silence of the site, filled with yellow wildflowers and thickly carpeted with grass, was a far cry from what it would have been like there as miners spent a summer panning 2kg of gold out of the waters below. 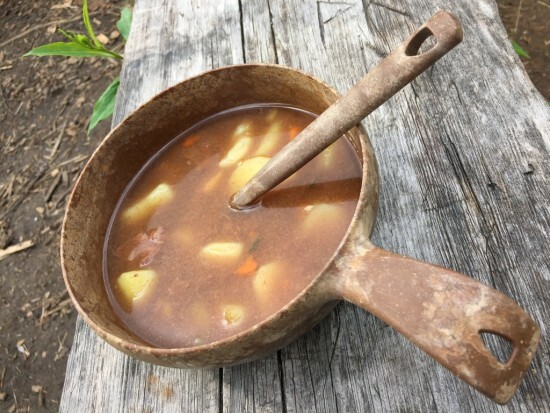 A warm soup served in a traditional kuksa. Very welcome at this point in the day! While I only spent three days in Saariselkä, with everything I managed to squeeze in I came away feeling like I’d been there significantly longer. As well as the experiences I described above, I made time to hike the fells of Urho Kekkonen National Park and be chased by a squirrel through a parking lot after he thought I was trying to steal his pizza. The times I’ll remember most, though, are the ones that pushed me out of my comfort zone. So next time I see a sauna next to a river — winter or summer — I’ll be getting in! What do you think — if you were heading to Saariselkä, which of these would you like to try? Would you find them to be a challenge or just take them in stride? My stay in the Saariselkä area was organised by Inari-Saariselkä Tourism, but as always, all opinions stated here are my own. Kamisak Farm is open in for husky farm visits from Tuesday-Friday in the summer months and costs €15 per adult and €7.50 per child. Of course, they offer one-day and multi-day husky trips all winter long as well. Fell Centre Kiilopää is open year-round, and visits to the smoke sauna (open three nights a week) cost €10 for those staying at the fell centre and €13 otherwise. Luonto Loma Pro Rafting offers the Ivalojoki rafting trip once a year near mid-summer — my trip was on June 27.